In the seventeen years since TWA Flight 800 came down off the coast of Long Island, erupting in flames and killing all 230 on board, two basic camps of skeptics have formed around the cause of the crash: missile people and non-missile people. What both agree on is that the ­government’s official version of the story, that a short ­circuit sparked gasses in the fuel tank and caused a massive explosion, does not hold up to scrutiny: After all, inspectors ­concluded there had been no damage to the fuel tank and found explosive residue on the downed plane. Plus, it’s awfully suspicious that the FBI, CIA, and Navy would get involved in an airplane-­malfunction investigation. 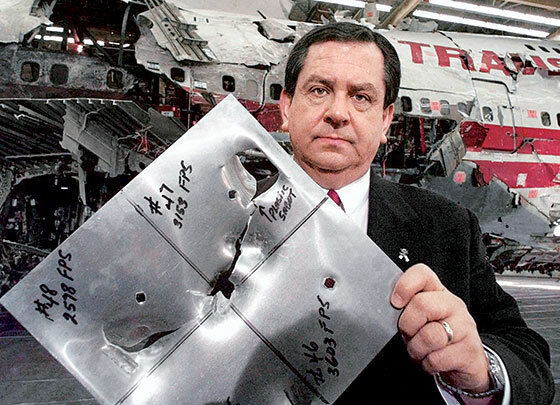 A physicist by training, Tom Stalcup became interested in the downed flight watching a simulation produced by the CIA and has become the controversial flight’s gadfly extraordinaire, suing government agencies to collect thousands of documents and persuading some of the flight’s original investigators to come forward as whistle-blowers, claiming critical evidence had been overlooked and witnesses said they’d seen a missile pushed aside. Peter Lance is a non-missile person. A reporter, Lance stumbled on Flight 800 while researching Ramzi Yousef, the bomb-rigging terrorist who had been held in a lower-­Manhattan jail next to Gregory Scarpa Jr., the underling son of the Colombo capo turned FBI informant. According to FBI files that Lance unearthed, Scarpa told the Feds that during Yousef’s trial for another bombing, the defendant planned to blow up a plane to cast doubt in the minds of jurors that he could have been the mastermind of the earlier plot. According to Lance, Yousef fulfilled his plan with TWA 800. Traces of the explosive RDX were found on the plane’s wreckage, and, according to a note Yousef passed Scarpa Jr. in prison, the desired ­explosives contained RDX. Of course, that information hasn’t convinced Harvard ­English professor Elaine Scarry, who’s been suggesting for years the plane was downed by “electromagnetic interference,” likely accidental, from a military craft.